Smart city initiatives are being increasingly rolled out around the world to tackle increased urbanization, meet environmental targets and reduce energy consumption of cities. Converting legacy streetlights into connected LED or connected solid-state lighting has become an important ingredient of digital transformation strategies for many cities. In this post the current state of global smart city development based on deployment of connected streetlights is examined. As part of this research, 111 cities were analyzed based on their deployment of connected streetlights across North America (36 cities), Europe (35 cities), APAC (33 cities) and Rest of the World (7 cities). The ranking is based on the level of deployment of connected streetlights as of 2017. The ranking shows which cities are at the forefront in embracing digital transformation in the management of streetlights, and how other cities can learn from these initiatives. Miami is the world’s number 1 city when it comes to rolling out connected streetlights. The city council is committed to achieve a carbon dioxide emission reduction of 25% by 2020 (compared to 2006 levels) as indicated in the MiPlan, Miami’s Climate Action Plan. The conversion of legacy streetlights into smart LED streetlights is one of the strategies enabling city governing bodies to reduce energy consumption, which in turn, reduces carbon dioxide emissions within their jurisdiction. The roll-out in Miami was performed by the technology firm Itron and the utility company Florida Power & Light. The nearly 500,000 units of connected streetlights utilize the IEEE 802.15.4g wireless RF mesh architecture, supported by the Wi-SUN Alliance. Itron retrofitted IPv6-based LED streetlights across the city. The connected streetlights utilize IEEE 802.15.4g wireless RF mesh architecture supported by the Wi-SUN Alliance. By leveraging Network-as-a-Service (NaaS) deployments to connect streetlight devices and applications the city was able to reduce CAPEX and OPEX. Moreover, connected streetlights generated 70% savings on annual streetlight energy costs for the city. Signify (formerly Philips Lighting) retrofitted 225,000 connected streetlights comprising of 84,000 locally manufactured Philips LED lamps and luminaires and 141,000 non-LED lighting solutions provided by Philips in Madrid. The connected streetlights are remotely controlled and monitored in a command center, including remotely controlling light intensity when and where it is needed. The city benefits from annual energy savings of 44% on previous costs for legacy streetlights. Connected streetlights in LA are being positioned to provide the backbone support to host other IoT applications. The city governing body in Los Angeles collaborated with Signify to deploy 110,000 units of licensed wireless technology based connected streetlights. Each connected streetlight is installed with a Vodafone M2M SIM card and utilizes Vodafone’s M2M wireless network to connect individual smart light poles to the Interact IoT platform via licensed wireless technologies. The streetlights in LA also act a Smart City Hub. For example, noise-sensing microphone modules were mounted on connected streetlights to monitor environment noise including gunshot sounds on a pilot test. Leveraging machine learning, the system will trigger an alert if it detects gunshot sounds or a motor vehicle collision. Additionally, EV Charging points were mounted on connected poles. Furthermore, Signify, Ericsson and the city governing body collaborated and deployed 100 units of Smart Poles utilizing 4G LTE. Signify deployed licensed wireless technology enabled connected LED streetlights in 2016. This enables city authorities to remotely monitor streetlight infrastructure, identify faulty lights and remotely control the lights. Each connected streetlight is equipped with a Vodafone M2M SIM card and utilizes Vodafone’s M2M wireless network to connect individual smart light poles to the Interact IoT platform (formerly Philips CityTouch) via licensed wireless technologies (e.g. 2G, 3G, 4G and soon 5G). Jakarta benefits from 70% annual energy savings and improved public lighting services. Meanwhile, Gridcomm, Siklon Energy Nusantara and the city governing body in Jakarta are collaborating to deploy more PLC based connected streetlights in the city. Deployment of Connected streetlights in North America will likely surpass Europe by 2023. IoT Analytics estimates that installations of connected streetlights in North America will reach 14.4 million by 2023 with highest deployment in the United States. Shipment of connected streetlight hardware devices (e.g. LED lighting fixtures, controllers, communication nodes, gateways, IoT Edge Routers) is expected to grow with a CAGR of 22% and surpass 9 million units in 2023. The penetration rate in North America is expected to increase by 21 percentage points from 7% in 2018 to 28% by 2023. The growth is driven by US government initiatives to deploy 18 million connected streetlights by 2025 in the US. Connected streetlight market in Europe is expected to grow with a CAGR of 6% in the next 5 years. The European market is expected to be valued at US$439 million in 2023 and penetration rate is likely to reach 12% by 2023, as the European Commission targets to deploy 10 million connected streetlights by 2025. This article builds on information from the Connected Streetlights 2018-2023 Market Report. The 96- page report examines worldwide deployment, revenue and shipment of connected streetlights, with segmentation analysis by region, technology, and product. Additionally, the report examines the market landscape, including a market share analysis, and identifies the 111 smartest cities in terms of deployment of connected streetlights by region and country. Feel free to get in touch with the author in case of any inquiries. 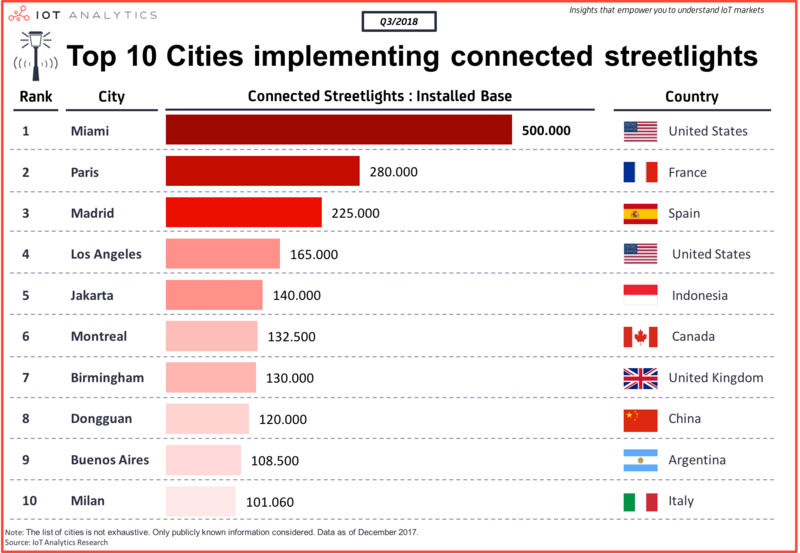 The post The Top 10 Cities Implementing Connected Streetlights: Miami, Paris and Madrid on top appeared first on IoT Analytics.